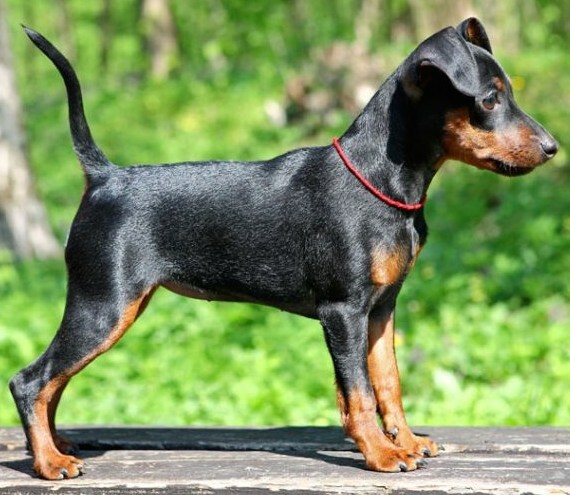 Toy Manchester Terrier was developed from the old English Black and Tan Terrier, known in Britain for some 400 years. Like his larger relative (Manchester Terrier), the Toy Manchester Terrier also triumphed as a ratter. Despite his small stature, he was formidable to vermin as was demonstrated in 1848 when a proud owner bet his dog could kill 300 rats in three hours. The match, held in the Queen’s Hotel Tavern in London, pitted Tiny The Wonder against the vermin. The 5-1/2-pounder did in the entire lot in just 54 minutes and 50 seconds! The Toy Manchester breed suffered a setback toward the mid-19th century, when breeders became more concerned with small size than health and soundness. Fortunately, there were enough caring breeders to correct the problems and put the Toy Manchester back on its feet. 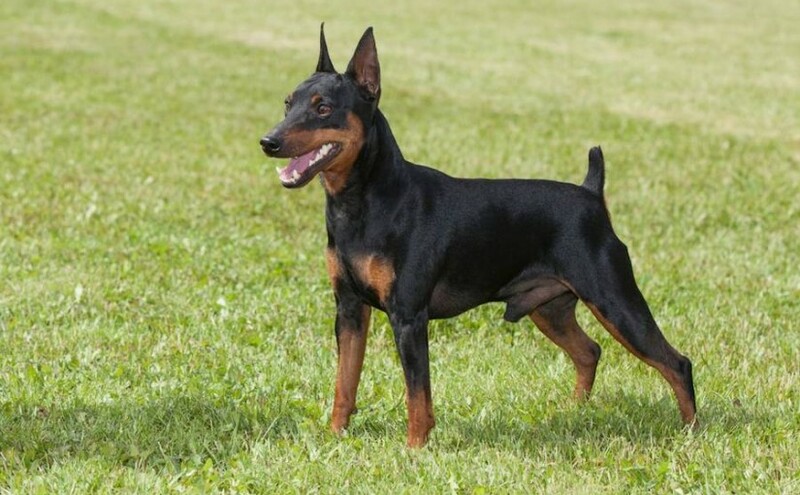 Toy Manchester Terrier Temperament: A middle-of-the road sort of temperament is displayed by the Toy Manchester that is neither aggressive nor shy. He’s devoted, discerning and observant of all that’s happening around him. The breed is generally friendly with other dogs. Size: Weight not exceeding 12 lb. (5.5 kg). All dogs weighing more than 12 lb. (5.5 kg) shall be disqualified. It is recommended that at all dog shows the open class shall be (and any or all other classes, except puppy class, may be) divided as: (a) under 7 lb. (3 kg); and (b) 7-12 lb. (3-5.5 kg). Head: Long, narrow, tight skinned, almost flat, with a slight indentation up the forehead; slightly wedge-shaped, tapering to the nose, with no visible cheek muscles, and well filled up under the eyes; level in mouth, with tight-lipped jaws. Nose black. Eyes small, bright, sparkling and as near black as possible; set moderately close together; oblong in shape, slanting upwards on the outside; they should neither protrude nor sink in the skull. Ears of moderate size; set well up on skull and rather close together; thin, moderately narrow at base; with pointed tips; naturally erect carriage. Wide, flaring, blunt tipped or “bell” ears are a serious fault; cropped or cut ears shall disqualify. Neck: The neck should be of moderate length, slim and graceful; gradually becoming large as it approaches, and blend smoothly with the sloping shoulders; free from throatiness; slightly arched from the occiput. Forequarters: Shoulders sloping. Forelegs straight, and well under body. Feet compact, well arched, with jet-black nails; and two middle toes in the front feet rather longer than the others. Body: Back slightly arched at the loin, and falling again to the joining of the tail to the same height as the shoulder. Body moderately short with robust loins. Chest narrow between the legs; deep in the brisket. Ribs well sprung out behind the shoulders. Hindquarters: Hind legs should not turn in or out as viewed from the rear, carried back; hocks well let down. The hind feet shaped like those of a cat. Tail Moderately short, and set on where the arch of the back ends. Thick where it joins the body, tapering to a point, not carried higher than the back. Faults: White in any part of the coat is a serious fault. Wide, flaring, blunt tipped or bell-ears are a serious fault. Disqualifications: Cropped or cut ears. White whenever it shall form a patch or stripe measuring as much as 1/2 inch (1 cm) in its longest dimension. Weight, more than 12 lb. (5.4 kg).